Ask fellow campers about "Cliffside County Park" and nearby attractions. There is a lot to like here: Close to Milwaukee, but not in the middle of everything. Super quiet even though it was full HUGE sites with smooth and level gravel pads Easy to navigate paved roads We hoped to be able to get to the lake from the CG but could not find a path. We found another nearby park with lake access. The lighthouse at Wind Point is a cool sight to see too. We camped at Cliffside County Park in a Travel Trailer. Very well kept park! Quiet at night. Nice surroundings. No sewer. Would have been $28 but we wanted a site reserved,so additional $12. We camped at Cliffside County Park in a Travel Trailer. Nice park but no sewers. Sites are all back-in but are fairly level and large with lots of shade. It is near Lake Michigan but you cannot see it from the campground. Reservations must be made either on-line or via phone and there is a $12 registration fee. We did not see any hosts or attendants but did see maintenance workers. We camped at Cliffside County Park in a Fifth Wheel. 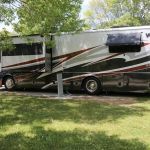 Beautiful campground, spacious sites, great location for touring Milwaukee, Racine and Kenosha. The site we had (47) was NOT level and we just couldn't get our motor home to level. In addition there are no sewer hook-ups at the sites. There is a dump station at the entrance/exit which we used. The Verizon service was good and we were able to get satellite service. I would have given this campground a 10 if it had sewer hook-ups and level sites. I would definitely come back here again. We camped at Cliffside County Park in a Motorhome. Milwaukee Public Mkt-fun. Foamation factory where we made our own cheesehead hats! Miller Brewery free tour. Harley Davidson Museum. S.C. Johnson Admin & Res Tower Tour was fabulous(lots of Frank Lloyd Wright architecture there). North Point Lighthouse tour. Bike ride past Bradford Beach and McKinley Marina on the coast of Lake Michigan. Free tour of Jelly Belly warehouse in Pleasant Prairie. Eat Hmong stuffed chicken wings at Bee's Cuisine, like nothing I've ever eaten. This is a very nice, very clean, very pretty campground with a lot of space between sites, lots of grass and fair number of beautiful trees. Hookups didn't include sewer in site #33, but elec/water were good. We did not use the restrooms. The paved roads made navigating to our site easy. We stayed two nights and enjoyed it. Cell service was quite good. The host was nice and efficient. We saw at least two playgrounds, one very nearby. There was road work nearby which was a temporary annoyance in getting to the park, but it'll likely be gone when you get there. We'd probably stay here again if we are in the area in the future. We camped at Cliffside County Park in a Motorhome. 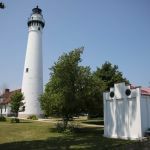 The Wind Point lighthouse is within easy driving distance and is worth it. The lake can be quite stunning at times. Well maintained county park with fair amount of space between each camper. Fair amount of trees but I had no problem getting satellite to work. Water pressure, Electric all good. We camped at Cliffside County Park in a Motorhome. A gem of a county park. Very basic, but the showers and restrooms were always clean. Spacious sites and lots of trees and greenery. lots of room for walking the dog and a grassy site for him to lounge around on. We camped at Cliffside County Park in a Motorhome. It's a county run park but it's clean and has lots of playgrounds for kids and trails for hiking. It's next to neighborhood baseball fields and soccer fields. I was happy with it. We camped at Cliffside County Park in a Motorhome. Take a hike to Michigan Lake and walk the neighborhood. We chose this as our first camping experience with our newly bought travel trailer and could not be happier. Super easy. Pull up, back in, hook up, relax & enjoy!! Happy Mother's Day weekend 2017!!! 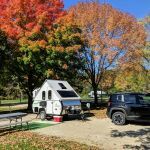 We camped at Cliffside County Park in a Travel Trailer. Reserve and pay online in advance of your trip!! So easy and hassle free! Stayed here for six days while visiting family in Kenosha. It was the only campground that was open and after checking out the other campgrounds we were glad to stay in this campground. Sites were all back in on gravel surface with room to park in front of MH. Electric was near middle of site. Had to use two water hoses to connect to water located at rear of site and between next site. Showers had plenty of hot water and kept very clean. Camp host was very helpful. Restaurants and stores were within 5 miles. Will stay here again on our next visit. We camped at Cliffside County Park in a Motorhome. Campground opened April 15 and will close at end of summer. All the major stores and restaurants are located within a 20 mile radius. 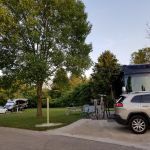 This is probably the cleanest campground we have ever stayed in. The sites are HUGE!! Very convenient to Milwaukee and Lake Michigan. We will come back here and stay again. 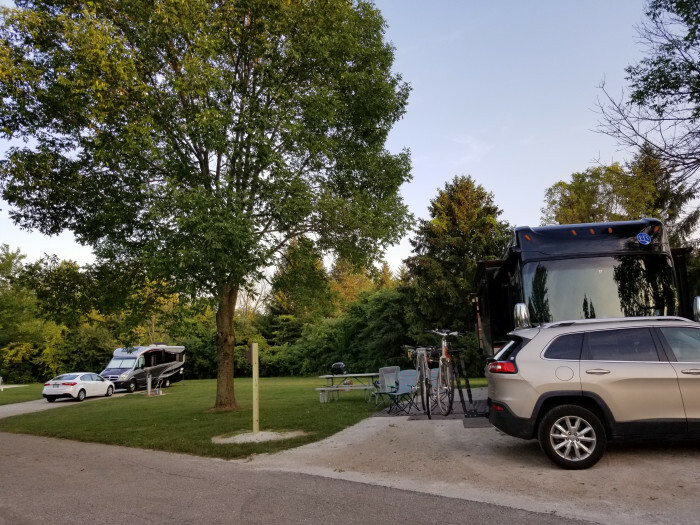 We camped at Cliffside County Park in a Travel Trailer. Really lovely county park with exceptionally clean restrooms. The site we had was lovely and spacious - we had lots of privacy and the view sightlines were still good as sites are staggered well. We enjoyed riding our bikes around the campground and found the easiest trail was off the group campground loop in the back of the campround. It is mowed and level and great for bike riding. We also walked through the woods from picnic area 2 and that was fun and went along a creek for a ways. Both end up overlooking Lake Michigan. I did not want to pay the $12 online reservation fee so we arrived on a Wednesday, checked the front board for openings (they allow reservations 7 days before hand for the walk in 1 - 42 sites) found a handful open and selfpaid. It is very tight on weekends so just know that going in. At the very worst, you can boondock overnight at one of the group sites that are very secluded or picnic areas although i am sure they don't appreciate that. there is a camp host at site 74 you can check with as well. We rode around the reserved side 43-92 and found plenty of openings there. TV reception with King Jack was only 2 - 3 channels. We camped at Cliffside County Park in a Motorhome. There is a lighthouse a nearby drive away that is very picturesque - Wind Point Lighthouse. We also drove in to Milwaukee for one day and found it to be lovely! There are miles of parks on the lake and then Lake Dr continues past many miles of mansions - wow! Outstanding county park nestled in the hardwoods near the shore of Lake Michigan. Close to 100 sites, and most will accommodate big rigs. Would rate this park a 10 if they had sewer, but dump station is easily accessible. We stay here for long periods of time when visiting family in Kenosha. Lots of hiking and biking trails. Bathhouses are kept very clean. Lots of space between sites, and a very quiet park, even on busy weekends. Camp hosts and maintenance man are absolutely the best. We camped at Cliffside County Park in a Motorhome. Campground is a bit in the country, but convenience store and gas nearby. Groceries within 15 minutes. The park is partly wooded with gravel sites. The large sites have W/E and a dump station at the entrance. Verizon service is strong at 4g. We picked up over 35 local TV stations including ABC, NBC and CBS. The park only had a dozen other campers while we were there. Water pressure was 45 lbs. Electric was good. Bath/shower house is centrally located in the park. Payment is by drop box. Very quite park. Enjoyed our stay. We camped at Cliffside County Park in a Fifth Wheel. This park is a hidden gem, in a quiet area well away from the Interstate but with good access. All sites have 50A/water and the dump station is convenient to the exit. The paved interior roads are in fair-to-good condition and oriented to allow rigs of any size to maneuver, albeit with some tighter curves and some stray branches that need trimming. The area is wooded, so use Google Earth to get an idea of the layout if satellite access is important to you. Roughly half the sites require advance reservations (there is an additional fee that is included in our daily rate) and half are walk-ups. The reservation rules can be complicated so read the web site carefully. The hosts had no record of our reservation, but were able to straighten it out quickly with my email confirmation. We stayed for a week mid-summer and things were mostly quiet. We didn't see any long-term campers other than the hosts (one for the whole 90+ site campground). There is no designated pet area and several signs warn that pets are not allowed outside the campground in the day-use areas. There is no WiFi or cable, as expected. Although near railroad tracks, we heard very few trains go by. We liked it so much we've already booked a return stay for later in the summer as we pass through the area again. We camped at Cliffside County Park in a Motorhome. Are you affiliated with Cliffside County Park ?